"Oh, God, who, together with the power of the keys of the kingdom of heaven, didst bestow on blessed Peter Thy Apostle the pontificate of binding and loosing, grant that by the aid of his intercession we may be released from the yoke of our sins." 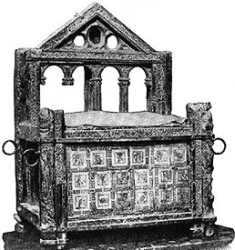 The image is a portable chair preserved at the Vatican and believed to be a chair used by Saint Peter, the extant testimony referring to it dating from the 2nd century. Farmer's daughter. Her mother died when Margaret was seven years old, and her step-mother considered the girl a nuisance. Margaret eloped with a young nobleman from Montepulciano, bore him a son, and lived as his mistress for nine years. In 1274 he was murdered by brigands, and his body dumped in a shallow grave. Margaret saw the incident as a sign from God. She publicly confessed to the affair, and tried to return to her father's house; he would not accept her. She and her son took shelter with the Friars Minor at Cortona. Still young and attractive, Margaret sometimes had trouble resisting temptation, but each incident was followed by periods of deep self-loathing. To make herself unappealing to local young men, she once tried to mutilate herself, but was stopped by a friar named Giunta. She earned her keep by tending to sick women. She later began caring for the sick poor, living on alms, asking nothing for her services. 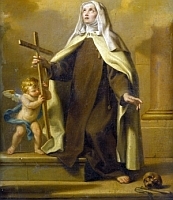 She became a Franciscan tertiary in 1277. Margaret developed an deep and intense prayer life, and was given to ecstacies during which she received messages from heaven. In 1286 Margaret received a charter to work with the sick poor. She gathered others of like mind, and formed them into a community of tertiaries. They were later given the status of a congregation, and called the Poverelle (Poor Ones). With them she founded a hospital at Cortona. Margaret preached against vice of all sorts to any who would listen. She developed a great devotion to the Eucharist and Passion, and prophesied the date of her own death. Though she worked for those in need, and though the poor sought her help and advice, the calumny of her earlier life followed her the rest of her days, and she was forever the target of local gossips. One of eight children in the family of a stone mason. His mother taught the children religion, and would sprinkle them with holy water each night before bed. Attracted to the idea of mission work, Richard joined the Pallotines in 1919. Spiritual student of the Servant of God Joseph Kentenich. Ordained to the priesthood on 6 June 1925 in the diocese of Limburg, Germany. Teacher in several Pallottine and Schoenstatt schools beginning in 1926. In 1927 he diagnosed with tuburculosis, and collapsed from exhaustion; there was thought to transfer him to South Africa for his health, but he was considered too sick to surive such a trip. By 1928 he was somewhat recovered, and insisted on resuming teaching. In 1931 he was assigned to schools in Upper Silesia. A skilled and popular preacher and retreat leader, Richard was known for condemning the ideology and actions of the Nazis, especially the murder of disabled people and others considered an unproductive burden on society. He was arrested for this on 7 March 1937 in Roppach, Germany, but was warned and released. Father Richard became an indirect collaborator with the Resistance, and spoke so forcefully and so often against the Nazis that his superiors began to worry that the Nazis would retaliate against the school where Richard taught. He was arrested again on 8 April 1943 in Branitz, Germany for making political statements, and was imprisoned first at Ratibor, Germany, and then in the Dachau concentration camp where he was forced to do manual labour for the SS, and where he would remain the rest of his life. He became friends with fellow prisoner and future Cardinal, Josef Beran, who taught Father Richard the Czech language so he could help minister to imprisoned Czechs. When typhoid broke out in the camp, Father Richard volunteer to minister to the sick until he contracted the illness himself. Martyr. Born to the nobility, the daughter of Count d'Emile Oultremont de Wégimont a de Warfusée, a diplomat who represented King Leopold I to the Vatican. From childhood émilie had a great devotion to the Eucharist and the Sacred Heart of Jesus; she later developed a great admiration of Saint Ignatius of Loyola. Married to Victor van der Linden, Baron d'Hooghvorst in 1837. Mother of two boys and two girls. She sought out Jesuits for spiritual guidance. Widowed in 1847. When her sons entered college in France, she decided to move, too. On 8 December 1854, the day the dogma of Mary's Immaculate Conception was proclaimed, émilie experienced a profound spiritual experience and announced she was going into religious life. 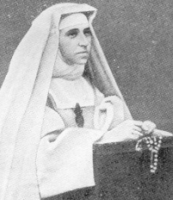 With a small group of young women, she founded the Institutum a Maria Reparatrice (Sisters of Mary Reparatrix) on 1 May 1857 in Strasbourg, France. On 2 May 1858 Emilie made her vows, taking the name Mary of Jesus. Soon after her daughters joined the Sisters, which caused even more turmoil in her family; few had supported her entering religious life, and many complained that the girls had followed only for her mother's sake. In 1859 Mother Marie received a request for help from Jesuit missionaries in Madras, India. The Sisters expanded to India in 1860, England in 1862, Belgium in 1863, Mauritius in 1866, France, Italy, Ireland, Spain, and then Jerusalem in 1888. The mother house was relocated from Strasbourg to Rome, Italy. Born a princess, the daughter of King Louis VIII of France and Blanche of Castile; sister of Saint Louis IX; aunt of Saint Louis of Tolouse. Declined a marriage offer from the German emperor in order to found a Poor Clare convent at Longchamps near Paris, France where she lived as a nun, though without taking vows. Circa 1259, Pope Alexander IV approved a Rule Isabella had written for what became the Order of the Humble Handmaidens of the Blessed Virgin Mary. Bishop of Ravenna, Italy in 546 by Pope Vigilius with the support of Emperor Justinian; the choice was initially so unpopular that the Maximian had to live outside the city walls for a while. Built the basilica of Saint Vitalis, and either built or renovated many other churches. Commissioned a number of illuminated manuscripts, and made sure that the text were updated with the most authoritative versions. May have been the first Latin bishop to use the title archbishop. Fifth-century cave hermit near Cyrrhus (in modern Syria). Spiritual student of Saint Thalassius. Spiritual student of Saint Maro. Lived in a small stone hut on a hill top, and talked to would-be students through a small hole; they came so frequently that he built a house on the hill top for them to stay. A noted healer, he built two houses for the blind, and induced any would-be spiritual students to contribute to care for the poor and lame. Monk in France. Invited by King Alfred of England to restore faith and learning to the English abbeys ravaged by the Danes. Abbot of Athelingay. Murdered in a church at night by two French monks who were under his guidance, but rebelled against it. Considered a martyr as his death was caused by working for the Faith. Second century Apostolic Father. Friend of Saint Polycarp of Smyrna. Bishop of Hierapolis, Phrygia (in modern Turkey). Author of lengthy commentaries on the life, teaching, and works of Jesus; they survive only in fragments. Born wealthy but preferred the life of a poor hermit. Monk and then abbot at the monastery of Saints Peter and Paul near Nicomedia, Bithynia (modern Izmit, Turkey). Flogged, imprisoned and exiled during the iconoclastic persecutions of Emperor Leo V. Supported Saint Theodore Studites. Jesuit priest. Missionary to Japan. Martyred with 60 companions by being exposed to the cold for days. Hermit in a tiny shack in Cyrrhus, Syria; he wore animal skins, lived on whatever came to hand, and spent every possible moment in prayer. Emperor Leo I of Constantinople wrote to Baradates for his thoughts on the Council of Chalcedon in 451. Member of the Claretians. Martyred in the Spanish Civil War. Mercedarian friar at the convent of San Lazzaro in Zaragoza, Spain. Known for his personal piety and outlook that saw the hand of God in all things. Dominican. Bishop of Iglesias, Sardinia, Italy in 1330. Monk at Beaulieu Abbey near Limoges, France. One of Jesus's 72 disciples. Preached in Cyprus. Martyr. Bishop of early 4th-century Vienne, France. Irish nun. She is mentioned in the Tallagh and Donegal martyrologies, but no details of her life have survived. Fifth-century cave hermit near Cyrrhus (in modern Syria). Spiritual teacher of Saint limnaeus. Known for his personal piety and holiness. Missionary who worked with Saint Breaca in Cornwall. Third bishop of Alexandria, Egypt c.84. A memorial for all the unnamed Christians martyred in the desert and mountainous areas south of the Dead Sea during the persecutions of Emperor Valerius Maximianus Galerius.